This article has been written by Loupa Pius of the Dodoth Agro-pastoralist Development Organization (DADO). Pius is a member of the ELLA Community; he has taken part in the Learning Alliance and Study Tour on Pastoralism and Land Tenure, and was an ELLA LEAP Award recipient. The following article discusses the plight of pastoralists in the Karamoja in the face of changing public policies regarding land tenure in Uganda. As I toured across the Karamoja sub-region of Uganda I got strong impressions that the recently won relative peace is under threat from emerging and spreading land and land related conflicts. The Karamoja sub-region is predominantly a pastoralist economy. Pastoralism is an extensive production system practiced in the region predetermined by its semi-arid climate. Consequent to the successful disarmament exercise which restored law and order and ushered in an era of relative peace, Karamoja became open to the rest of the world. Following this there has been a rush to explore the region’s business potential by internal and foreign investors. This turn of events has come at the expense of pastoralists – the original inhabitants of the sub-region. Increasing infrastructural development, trade and commerce in the sub-region have increased the demand for and value of land, which has resulted in land speculation and grabbing. These phenomena are posing a threat to pastoralist livelihoods as increasingly more land is earmarked for agriculture, mining, settlement and conservation. Karamoja grazing land is diminishing. I have trekked Karamoja. From the west the Acholi community has claimed part of the land; from the southwestern side of Abim the Lango community has done a similar job; in the southern part the Teso communities are claiming our land and from the East the Turkana are pushing us out while the Toposa and Kidepo are squeezing us from the North. Internally Uganda Wildlife Authority (UWA), National Forestry Authority (NFA) and our own children are selling our land to foreign investors for their own benefits. When we request to move into Lango, Teso and Acholi areas in search of water and pasture for our animals, communities and their leaders claim we are out to grab land or steal their animals. Where shall we go then? The cow does not have boundaries and so do I. I look for nothing else but pasture and water. My cow is my wealth, my culture and my life and I follow my animals to where they lead me. –Elder Lopeikume Lowari, Kotido District. These strong statements from elders hint on realities of pastoralism as an endangered livelihood. It calls for recognition of livelihood security in Karamoja as a demanding venture which requires deliberate integration of indigenous knowledge, experiences and traditional practices into national policies for efficient and effective interventions. It is important to recognize that pastoralists have special but untapped knowledge which enables them to survive in semi-arid ecological zones without causing much harm to the environment. Mobility is a natural mechanism by pastoralists to enhance replenishment of pastures and access reliable sources of water whenever they receive warnings of depletion. Whereas movements take pastoralists away from their homes it should be noted that such occurrences are decisive moves by herders to provide for natural resource renewal. Nutrition wise such mobility is usually intended to enhance productivity of animals as they access fresher and adequate pastures and water such that more milk, meat, blood, butter and related products can be availed to households. In practice far kraals have usually encouraged kraal-home visits to deliver supplies to old men and women, children and girls who stay back home. Pastoralism has enabled the Karimojong to survive and respond to the difficult living conditions which are prevalent in the sub-region. This is not meant to exonerate pastoralism as the only option for the Karimojong. Rather it calls for us to look at what is practicable and give outsiders a lens to look at pastoralism as a livelihood and not just an economic or abstract option. When relating pastoralism and land tenure in Karamoja so as to underpin the land insecurity debate it is worth mentioning that there are four constitutionally recognized land tenure systems in Uganda: customary (communal), freehold, leasehold and the holding of registered land in perpetuity and having roots in allotment of land pursuant termed as mailo land tenure in Uganda. However, mailo tenure permits the separation of ownership of land from the ownership of developments on land made by lawful or bonafide occupant and the practice not exploited in Karamoja. Of these; customary tenure is predominant in Karamoja. In recent years, however, land tenure systems in the sub-region are swiftly changing. Individual ownership of land is growing and causing tensions within and between communities. Agriculture and infrastructural developments are limiting the mobility of pastoralists. Karamoja has since time immemorial enjoyed communal land management provided for under customary tenure in the laws of Uganda. In practice communal land management involved clan leaders [elders] taking the responsibility of protecting, managing and allocating land among clan and community members. Communal land was usually divided into: grazing land mainly made up of rangelands with water holdings and forages like grass and trees; land for settlement, usually in rocky and mountainous areas; and land for subsistence agriculture mainly for growing cereals like sorghum, millet, bulrush and vegetables. Boundaries were respected even without formal land registration while traditionally set dos and don’ts provided for access to vital resources. Use of land, water, grass, trees and salt licks was regulated to avoid degradation. However, use of land by pastoralists as common resource has increasingly come under pressure. Universal access has been constrained by individual registration of land. To the pastoralist, however, land ownership is not the main challenge to their livelihood, but rather denial of access to water and pasture, which can be as troublesome as any other man-made disaster. 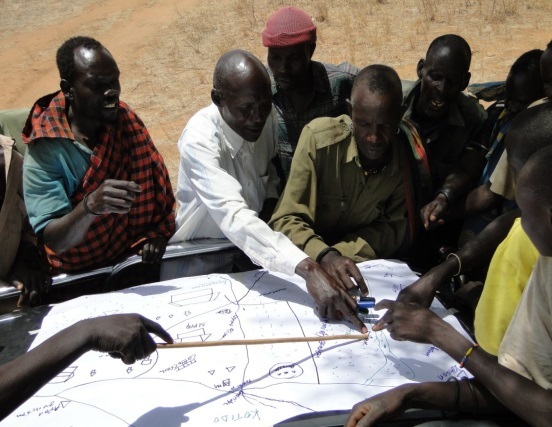 Linking the pastoralist and land tenure debate to the policy framework in Uganda, the obvious findings are that a number of policies in the country have been developed with little or no consultation with pastoralist communities. A case in point is the “Draft Pastoralism and Rangeland Management Policy” with a pastoral code which was a result of consultations conducted in 2006/7 all over Uganda, but excluding Karamoja and some parts of northern Uganda due to insecurity which stalled the experts from accessing the regions. It was in 2010 when the Ministry of Agriculture Animal Husbandry and Fisheries (MAAIF) reviewed the policy. MAAIF during the review, the stakeholders from Karamoja and the greater North were considered for participation and so a number of gaps were identified ranging from rangeland access rights, transboundary issues and ecosystem restoration. However, after the review by the ministry and stakeholders involved the policy continues to be shelved for more 8 (Eight) Years from 2010 to date still as a draft. With this policy in place as a draft in the Ministry shelves; the question remains ‘why are experts and policy makers reluctant to put in place a policy that caters for pastoralist communities?’ and ‘why is pastoralism viewed as a threat to development by state actors and investors? ’ The Answers to this questions will be explained by our own political representatives and technical staffs working for the betterment of pastoralists livelihoods in the region and the country. Land is the source of our livelihoods as pastoralists; we live on land together with our livestock. Land is a home and a carrier of all we need in Karamoja. It carries water, pasture, honey, fruits and vegetables, including wild game. So when they take away our land where shall we go, to the mountains or airspace? If there is grass growing on space we would not think of struggling on earth. With this in mind, I recalled the catchy advocacy words used by the people of Kautakou of Moroto and Napak “Take anything but leave our land”; a phrase now used by Karamoja Development Forum to advocate for pastoralists’ land rights. Worth noting is that every time we lose land and a herder we lose vital information about land, pastoralism and nature. Karimojong pastoralists do recognize that land ownership and management is changing, but at their expense. During interactions with our visitors from Tegemeo Institute of Agricultural Policy and Development [on 13th April 2017], Nangiro Joseph, a kraal leader of Loyoro sub-county informed us that land in the pastoralist corridors of Loyoro and Kaabong and other prominent grazing areas by the 1950s was under the management and supervision of elders. Grazing areas like Kapeta and Morukoyan were used for dry season grazing. Grazing plans and movement decisions were made by elders and implemented by shepherds. Joseph reiterated that it was in 1998 that their cattle were denied access to fresher pastures and waters as Uganda Wildlife Authority (UWA) and National Forest Authority (NFA) earmarked grasslands for wildlife conservation and forest reserves. These developments meant livelihood insecurity by limiting the mobility of pastoralists. But pastoralism of today in Karamoja has gradually changed including the land use practices, social settings; there are now varies policy changes within the context of pastoralism in Uganda some of the changes infiltrating include school enrolments increasing, more settlements emerging, and Livestock markets both local and a cross border. Correspondingly, during a land rights based meeting organized by Dodoth Agro-Pastoral Development Organization (DADO) in March 2017 in Kaabong district, a local government official clearly pointed out that pastoralists’ and farmers’ rights to land were insecure all over Uganda. He explained that conflicts were on the rise between land owners and users and that land governance had become increasingly challenging. These add on to the fact that pastoralists in Karamoja are finding it difficult to access water and pastures; grazing areas are diminishing and consequently land degradation has emanated from overgrazing. Discussing land insecurity and vital natural resources are not a matter of Karimojong pastoralists only. There are other ethnic groups in Uganda like the Basongora in Kasese who have been pushed out of their land by Bakonzo agriculturalists. Encounters between pastoralists and agriculturalists have been conflictual and in some cases violent interfaces involving heavy loss of lives and property have been registered. Examples include clashes in Ntungamo and Nyabushozi. In Karamoja communities in and around conservation areas like Ngi’porein of Dodoth west struggle to reclaim grazing areas of Lolelia, Kacheri and Morungole. In Kabarole violent conflicts have been reported between pastoralists and farmers (Owaraga, 2015). With the adversely changing climate and unsupportive policies ‘What do Ngi’karimojong think about their pastoral livelihoods in the next 50 years?’ This question can find answers from examples of countries and civil society networks that are calling for the United Nations to recognize pastoralists’ societies. This opportunity lies in the “International Year of Rangelands and Pastoralism 2021.” We can join hands to advocate for our day, our rights and our lives as pastoralists. The opinions expressed in blog entries by ELLA Community members are theirs alone unless otherwise stated, and do not reflect the opinions of The ELLA Network. This article is part of the Research Blog Series, which focuses on current research or analysis on ELLA themes conducted by our community members.